Staff Sgt. 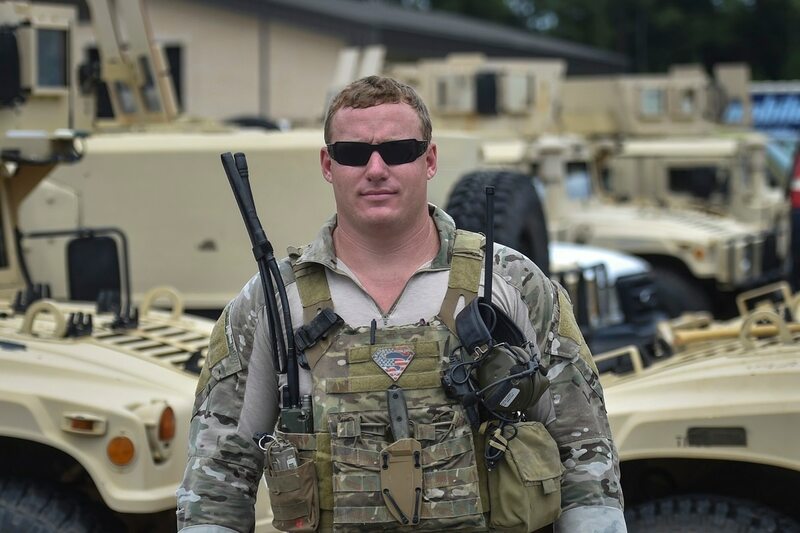 Christopher Lewis, a combat controller with the 23rd Special Tactics Squadron, will receive a Silver Star for his actions during an intense 10-hour firefight near Mosul, Iraq, last October. Lt. Gen. Brad Webb, commander of Air Force Special Operations Command, will award Lewis the medal during a ceremony Jan. 19 at Hurlburt Field, Florida, the Air Force said Wednesday. Lewis was attached to a platoon of Navy SEALs as a joint terminal attack controller, escorting more than 300 Kurdish peshmerga forces. Their mission was to clear an unknown number of Islamic State fighters from two Mosul-area villages behind enemy lines on Oct. 20, 2016, according to the citation accompanying Lewis’ Silver Star medal, provided by the 24th Special Operations Wing at Hurlburt. Enemy fighters unleashed heavy, effective fire on Lewis and his fellow service members as soon as they entered ISIS-held territory. Lewis called for close air support, and his team tried to break contact while still taking fire. At the same time, his vehicle’s automated turret system for the .50-caliber machine gun became disabled. While ISIS fighters dealt out waves of accurate rocket-propelled grenade, mortar and small arms fire on the troops, Lewis “selflessly exposed himself to grave danger in order to control airstrikes within 400 meters of his team’s position,” destroying two ISIS fighting positions and an unknown number of ISIS fighters trying to maneuver, the citation said. A summary of the battle in the Air Force’s “Portraits in Courage” publication earlier this year said that Lewis “held this vulnerable position for hours despite direct enemy fire impacting within inches of him.” The Portraits in Courage summary said he directed airstrikes from F-15Es and B-52s. Lewis continued manning the .50-cal in an open turret, exposed to enemy fire, when an ISIS car bomb began racing toward his team and the peshmerga. He opened fire and destroyed the car bomb within 150 meters of his position, the citation said. At that point, ISIS fighters opened fire from the entrance of a concealed tunnel, about 100 meters from Lewis’ team, the citation said. His team tried to maneuver away from the enemy fire, when they spotted multiple pressure-plate improvised explosive devices on their route and were forced to stop. They began to back away, Portraits in Courage said, when another IED detonated, triggering seven more explosions. One vehicle was destroyed, and Navy Chief Petty Officer Jason Finan, a 34-year-old explosive ordnance disposal technician, was mortally wounded. The Defense Department released the identity of the sailor killed by an explosion on Thursday amid the U.S.-backed effort to retake Mosul from Islamic State fighters. Lewis immediately leaped out of his turret and rushed across the top of the truck to Finan, providing emergency medical care to try to save his life less than five meters of another, unexploded IED, while still under fire. Lewis pulled two remaining teammates, who had been dazed by the blast, from the damaged vehicle and organized a “hasty medical evacuation,” the citation said. Throughout the battle, Portraits in Courage said Lewis directed four airstrikes that killed more 20 ISIS members. He also engaged the enemy three times within 100 meters. “By his gallantry and devotion to duty, Sergeant Lewis has reflected great credit upon himself and the United States Air Force,” the citation said.